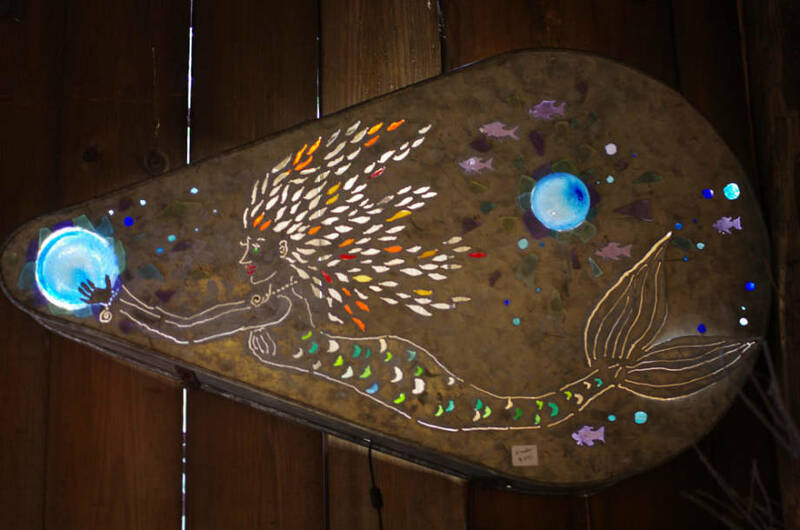 Mermaid design hand-cut into a retired galvanized industrial belt cover, with stain glass, glass buoy, and sea glass accents. LED light strip installed on the interior, with plug and switch. Measures 40" x 23". 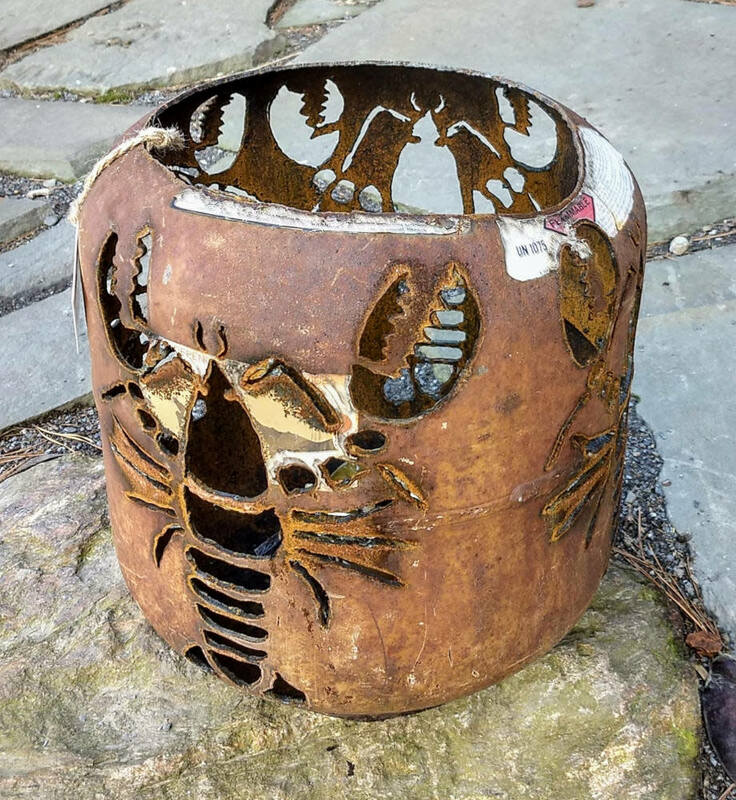 Four lobsters design hand-cut into a recycled propane tank with a plasma cutter. Comes with an outdoor torch candle. 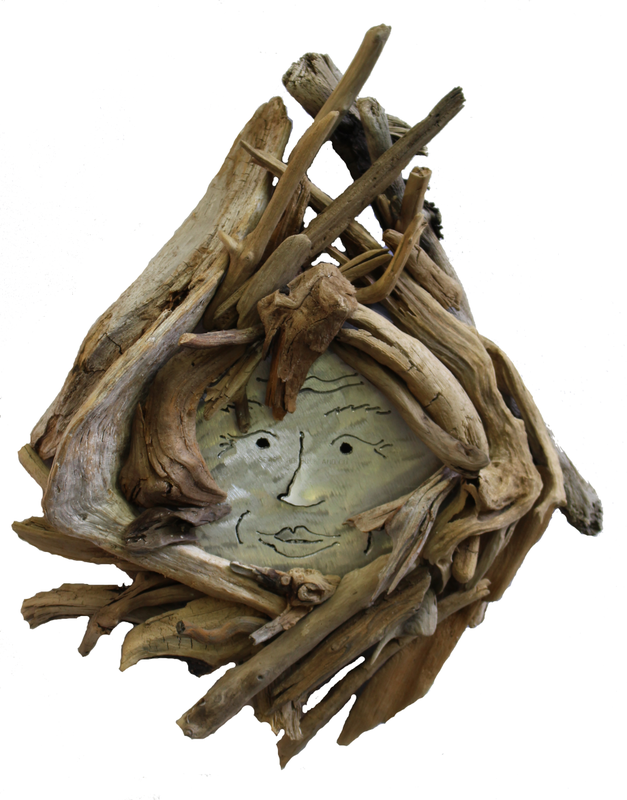 Part of my BEACH FINDS Series. 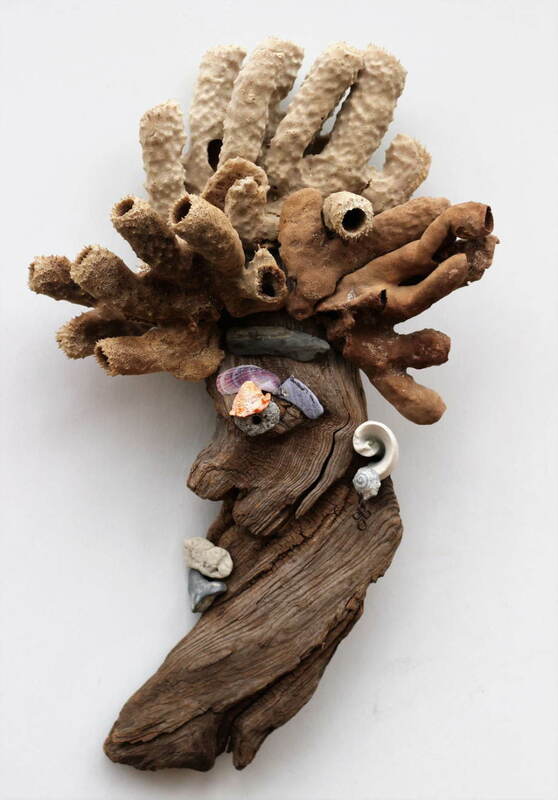 Found object scultpure with driftwood, lobster molt, sea urchin skeleton, coral, shells, metal and stones. Measures approx. 10" x 16". 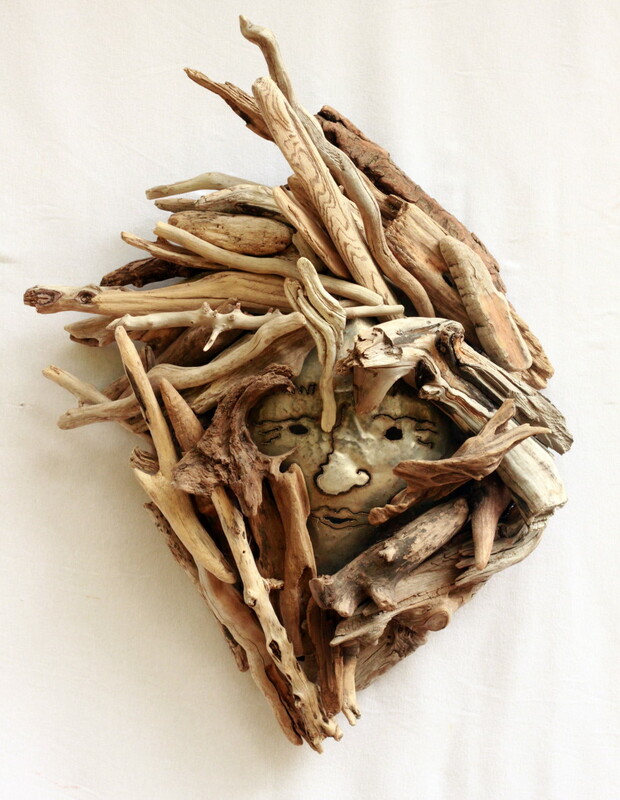 Found object sculpture in my BEACH FINDS Series. 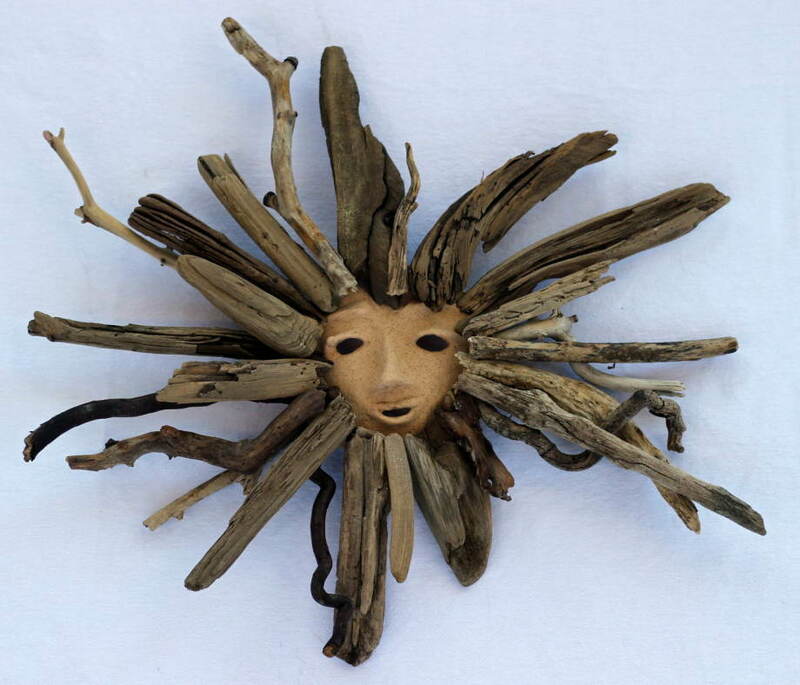 Bones, driftwood, and stones are used. 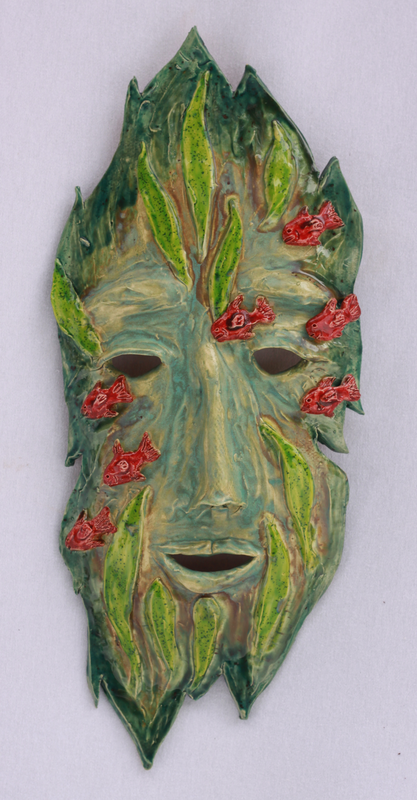 Hand-built with low-fire white clay, stained glass (eyes), and aluminum. Approximately 18 x 30 inches. 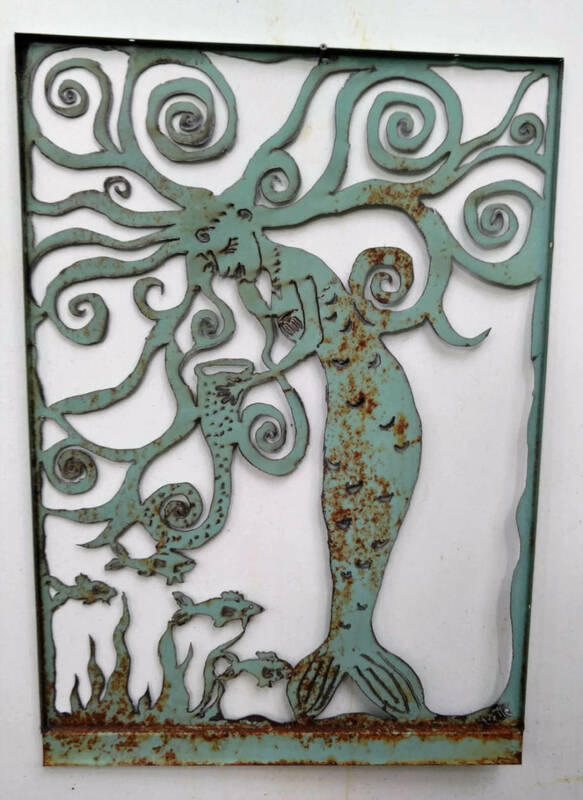 A mermaid design hand-cut into a furnace panel with a plasma cutter. Measures approx. 20 x 28 inches. 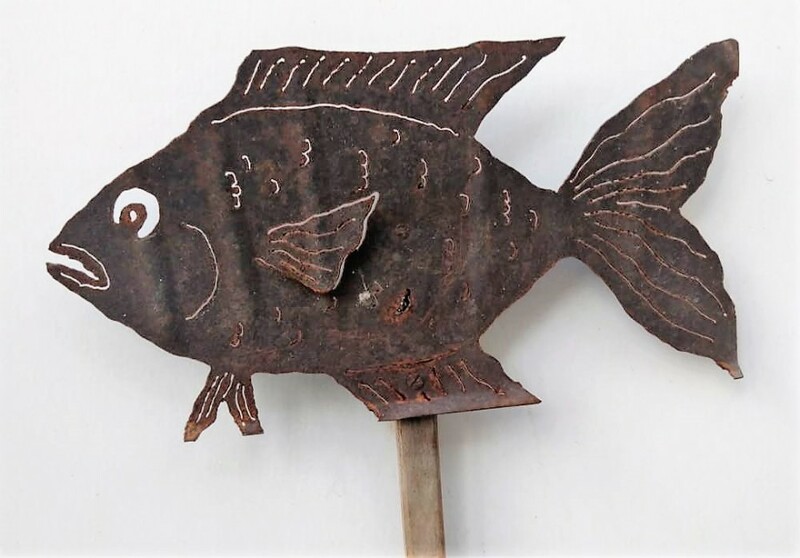 Fish design hand-cut into an old snow shovel with a plasma cutter. 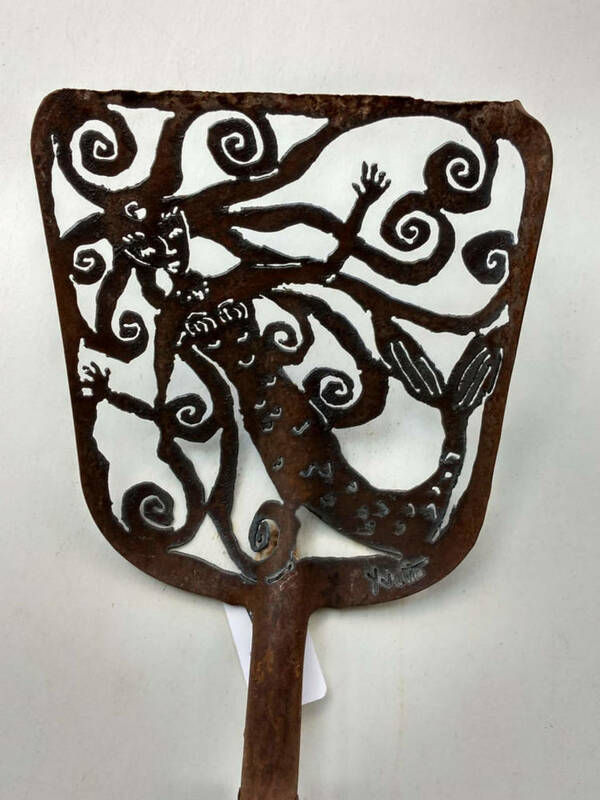 Mermaid design hand-cut into an antique shovel with a plasma cutter. 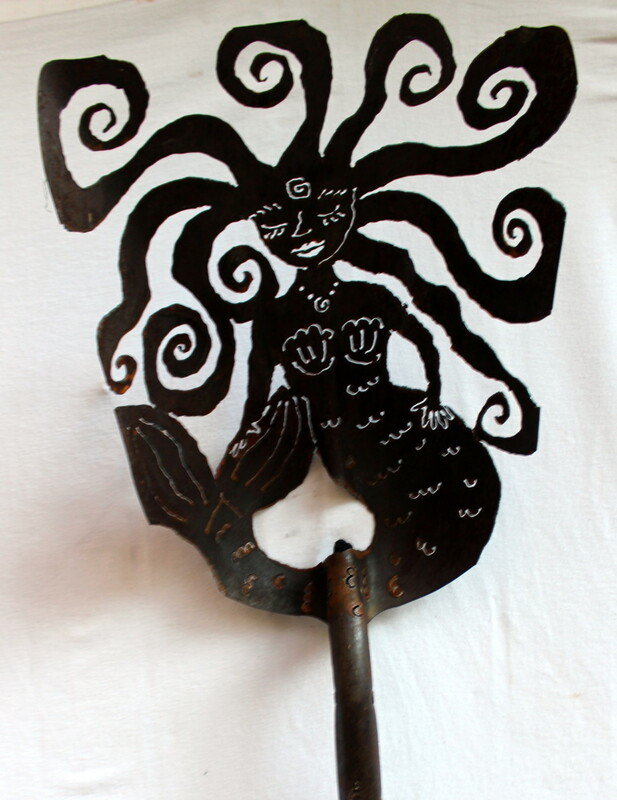 Found object scupture - part of my BEACH FINDS series. 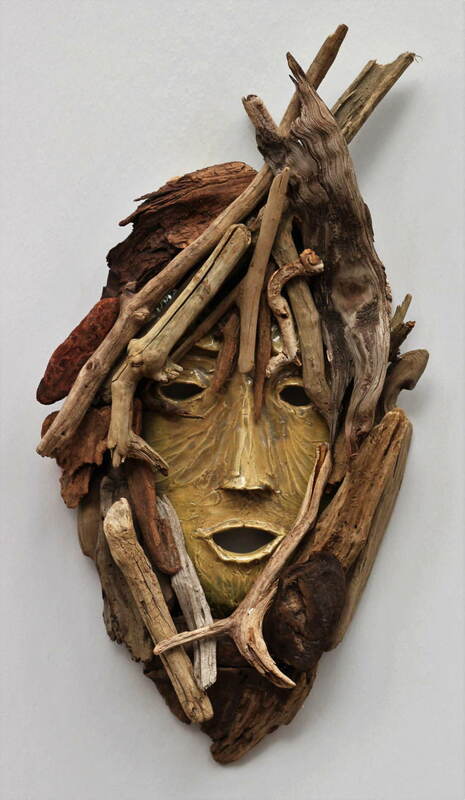 Created with driftwood, sponges, stones, coral and shells. Measures approx. 16" x 30". 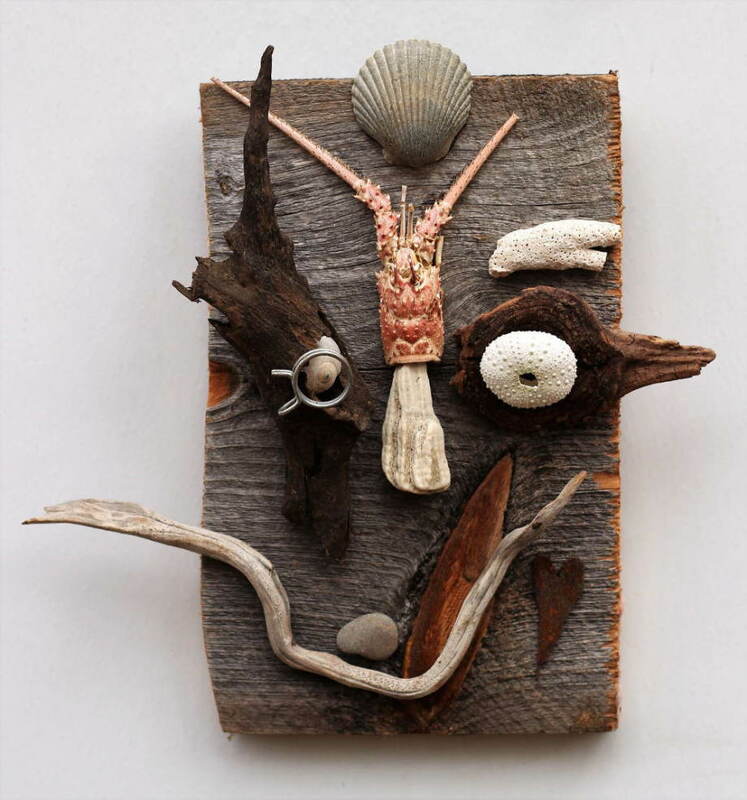 Found object sculptue - part of my BEACH FINDS series. 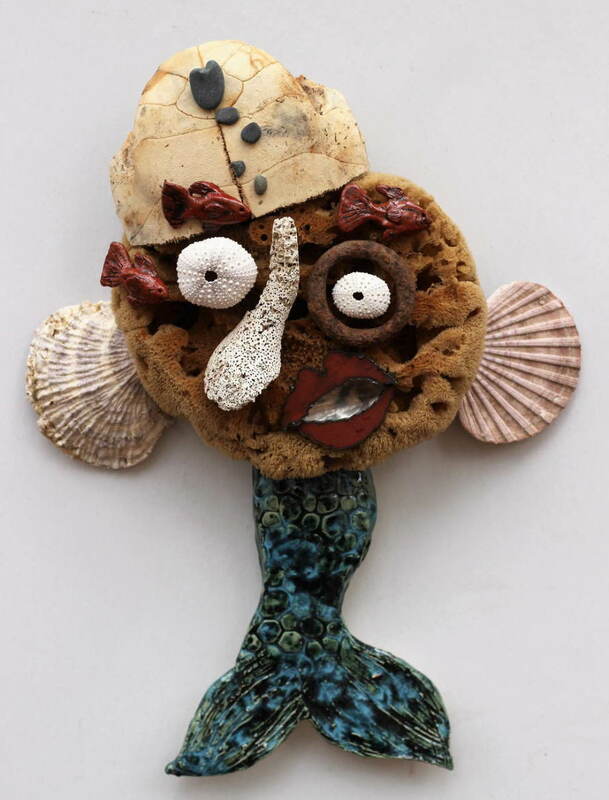 She's created with a natural sponge, sea urchin skeletons, shells, a spoon, beach stones, turtle plastron, and low-fire pottery tail and fish. Quite the beauty! Approximately 16" x 24" x 3". 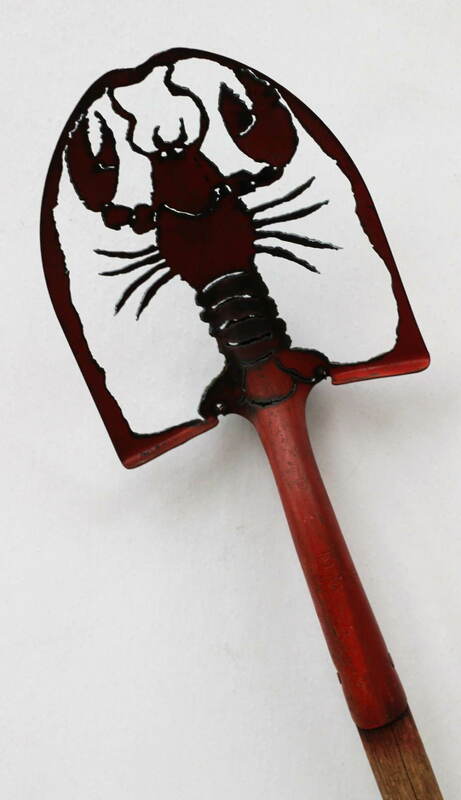 Lobster design hand-cut into a red-painted shovel. 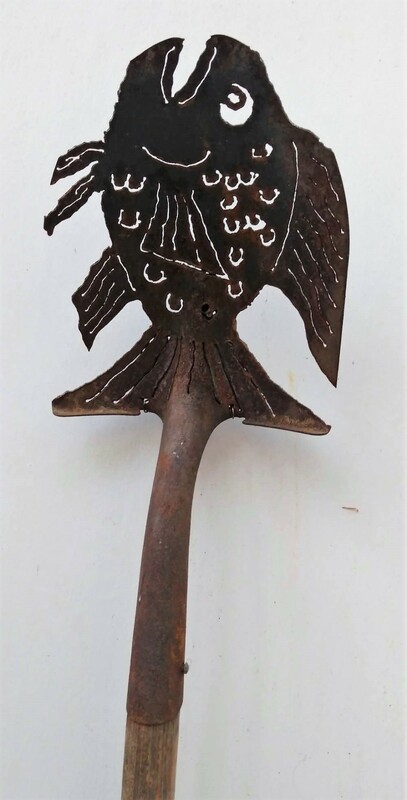 Fish design hand-cut into a shovel head with a plasma cutter. 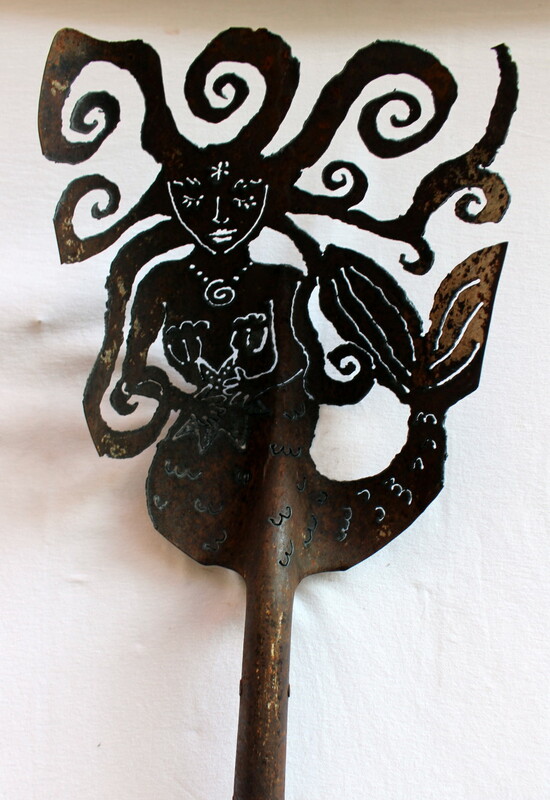 Mermaid design hand-cut in shovel with a plasma cutter. 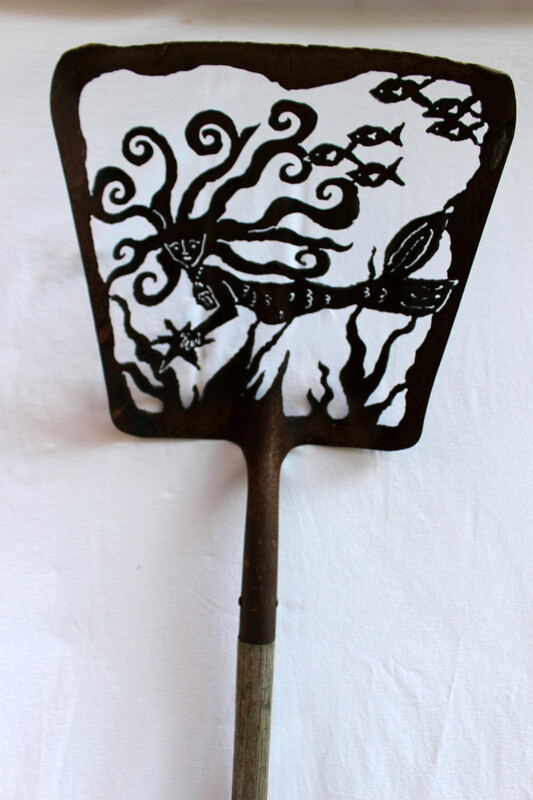 Red-eared Slider design hand-cut in a shovel with a plasma cutter. 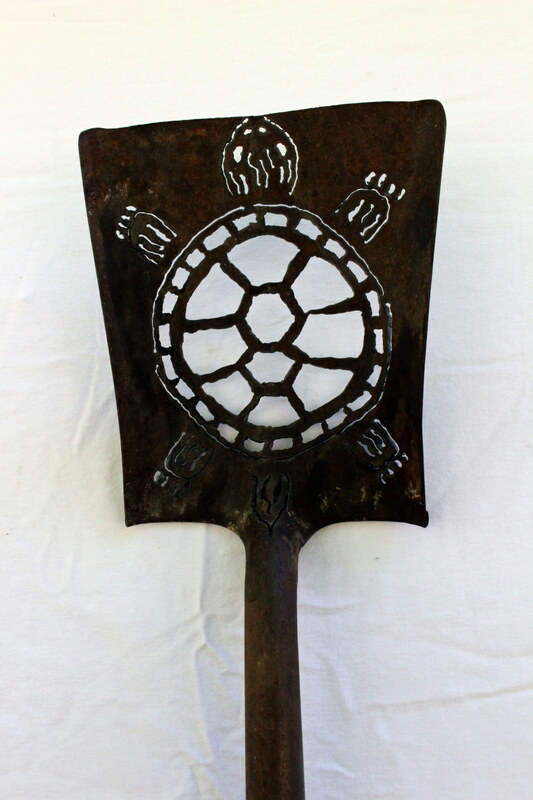 Painted turtle design hand-cut in a shovel with a plasma cutter. 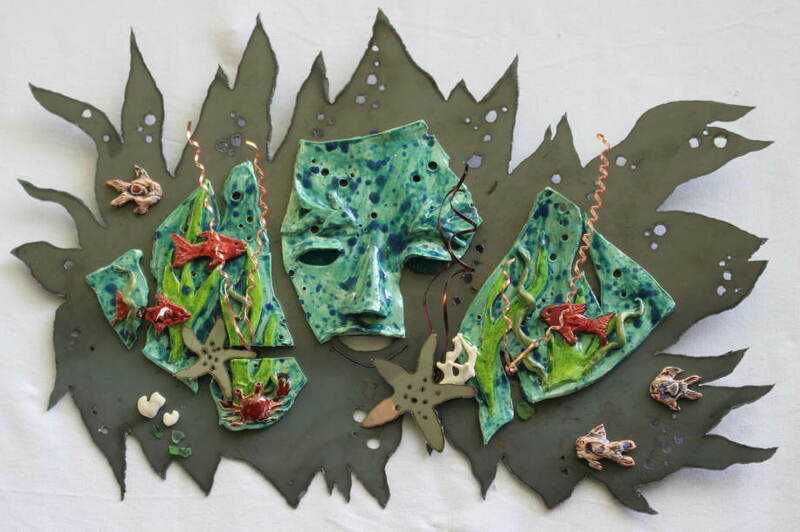 Hand-built out of low fire white clay, steel (the backdrop), stainless steel (starfish), stained glass (eyes), copper and aluminum wire (seaweed accents), and accents of seaglass and coral. 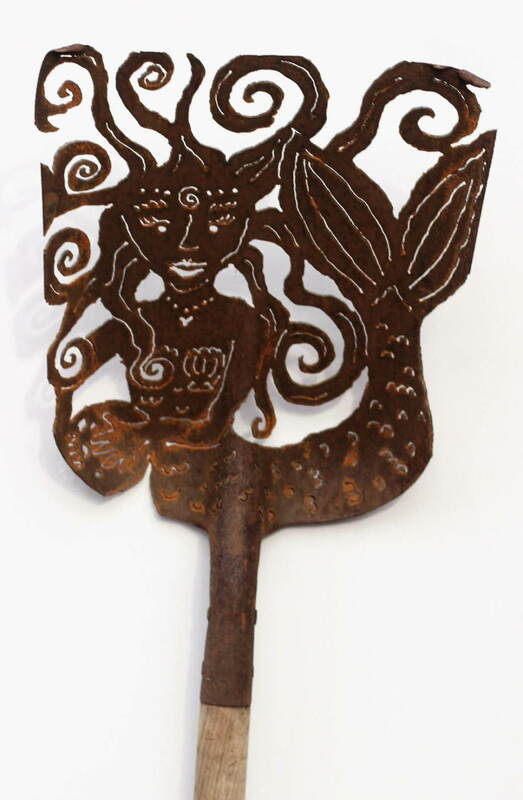 Measures approximately 36" x 24". 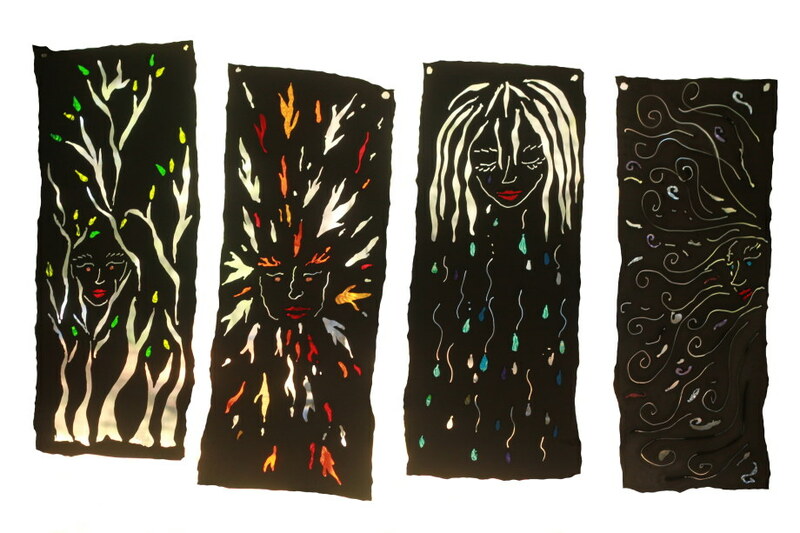 I love creating very different versions of Tempest. The clay with the metal is a lovely combination. 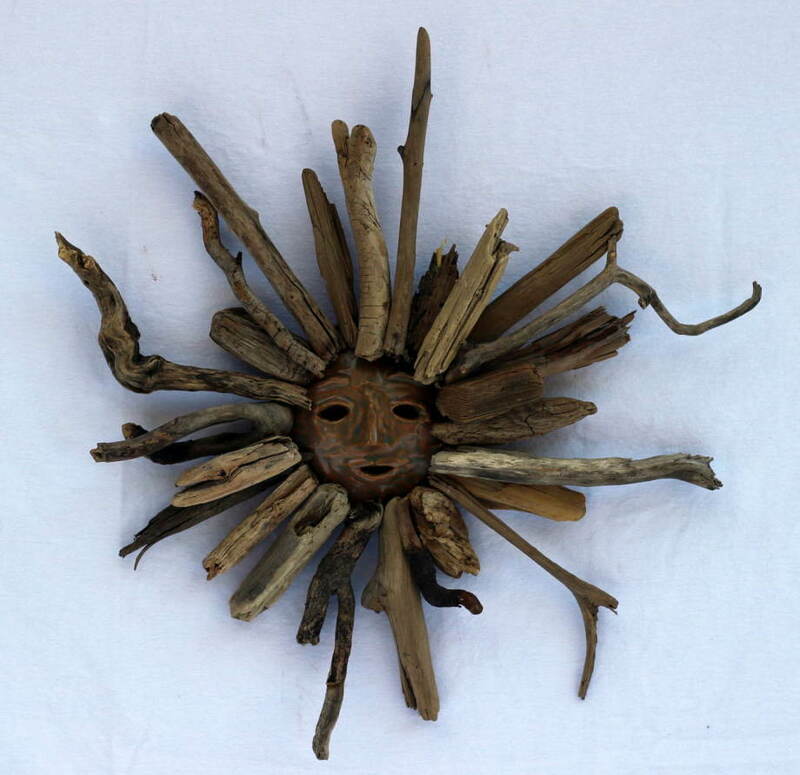 Little Drifter was created with driftwood (from Massachusetts, Maine, and the British Virgin Islands) and an aluminum pan. He measures approximate 18 x 24 inches. 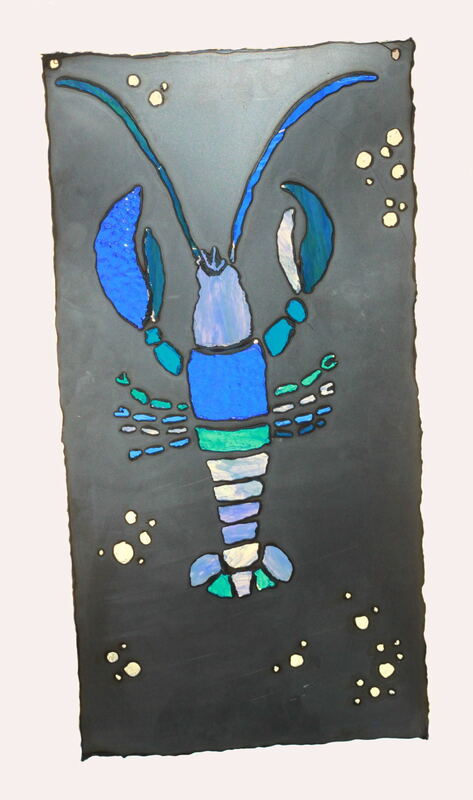 Steel, stained glass, and stainless steel (sea horse). Measures 20" x 24" x 3". Steel and stained glass. 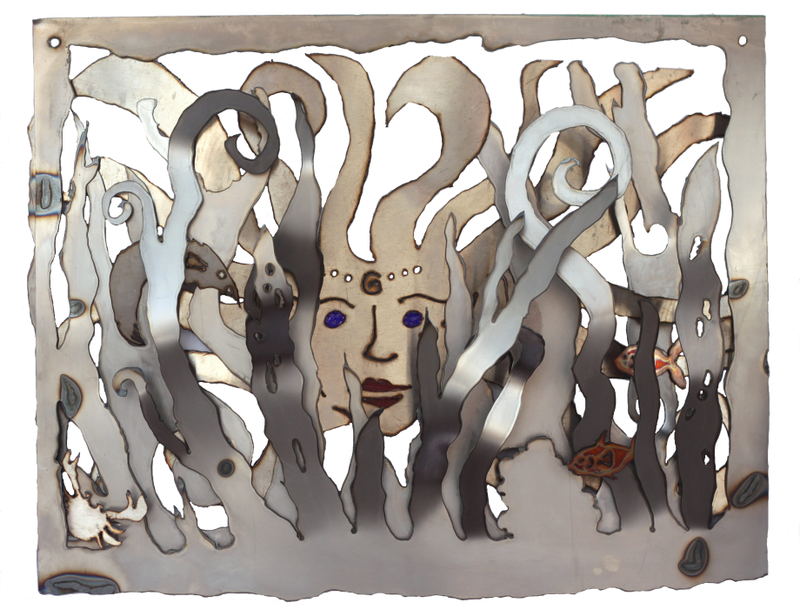 Measures 12" x 24". 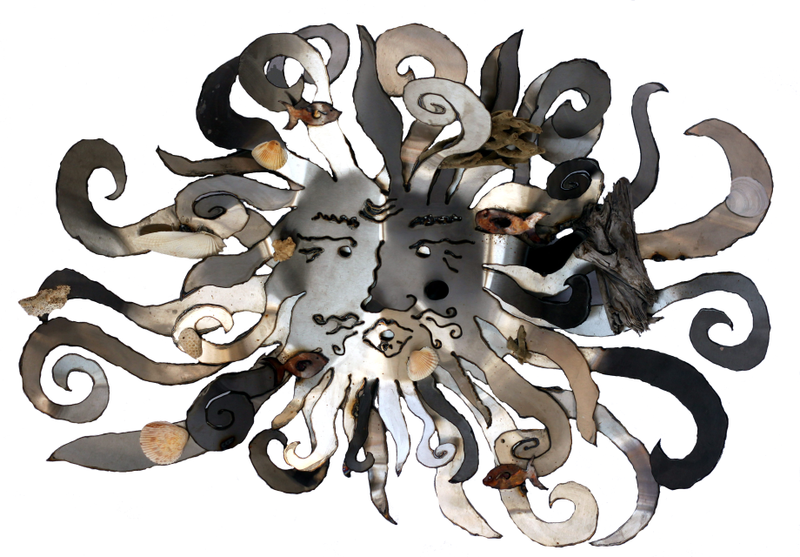 Galvanized steel pan, steel glass, and light. Measures approx. 9 x 14 x 6 inches. 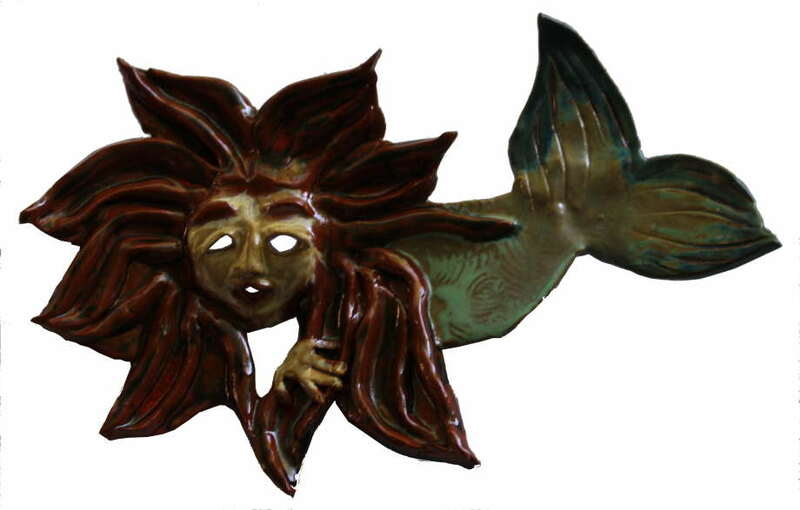 Ariel is made of steel and stained glass, with some copper wire accents. She measures approx 3 feet x 7 feet. 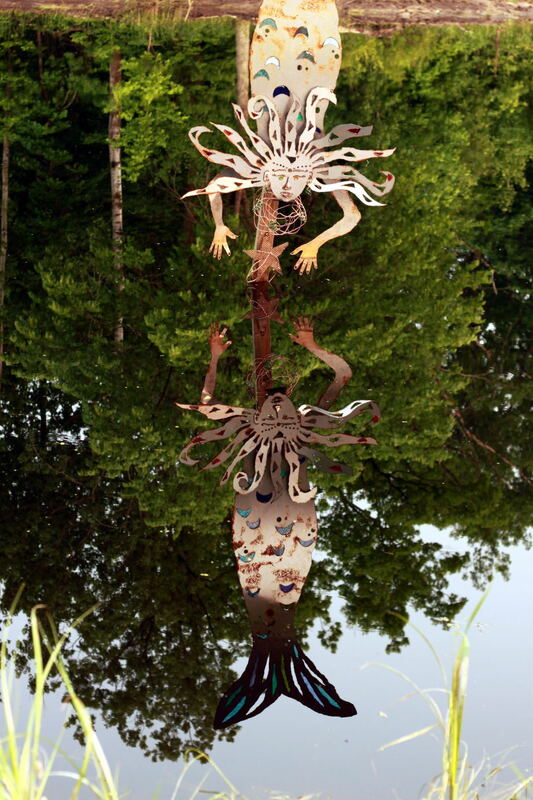 She is mounted on a post in a private pond. Stainless steel and sea finds. Measures 36 x 24 inches. 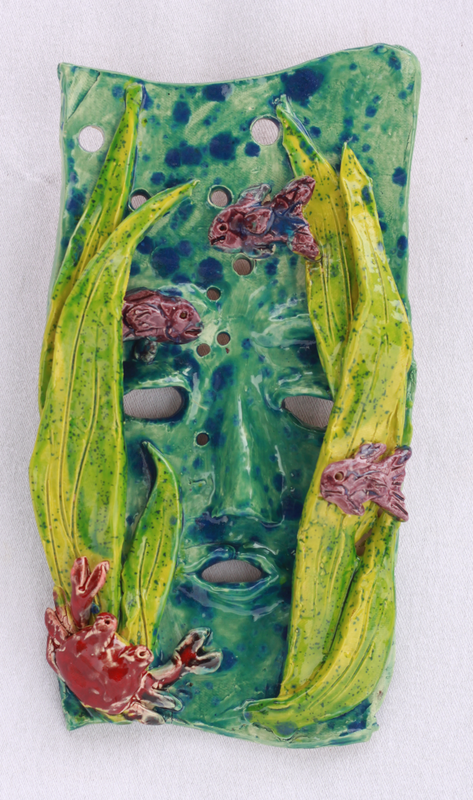 Steel, low-fire white clay, stained glass (eyes), and copper accents. 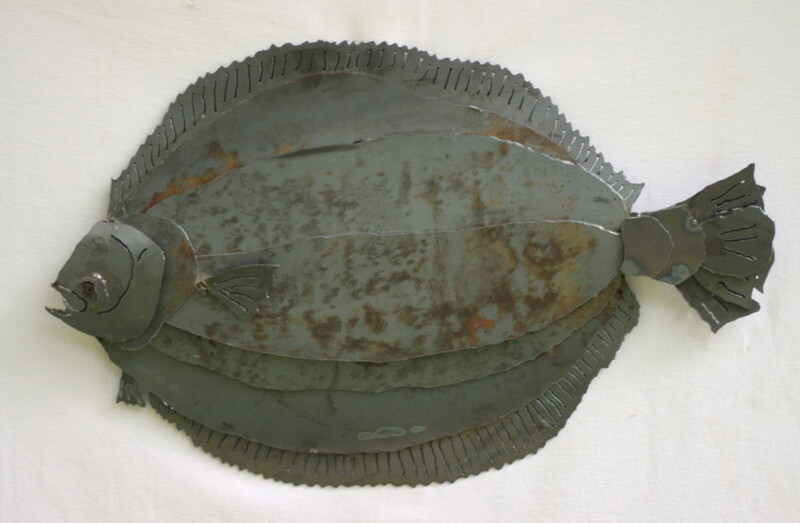 Measures 30 x 16 inches. 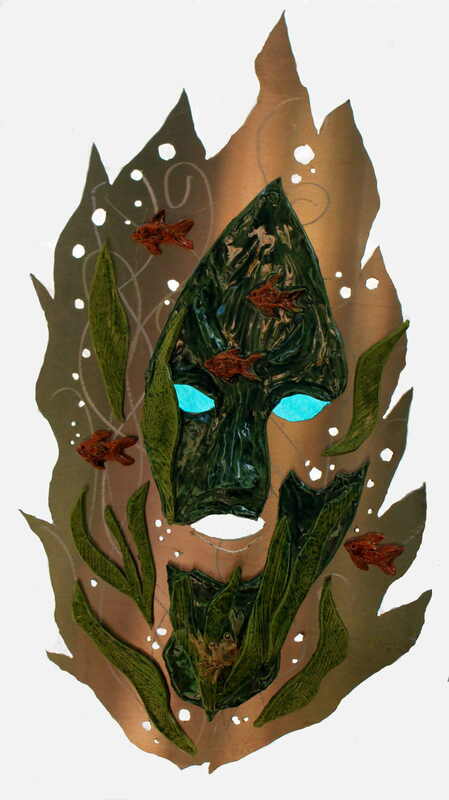 Steel, stainless steel (face and sea creatures), copper (fish), and stained glass (eyes and mouth). Measures approx. 30 x 24 inches. Madison is a woman peeking through the seaweed. 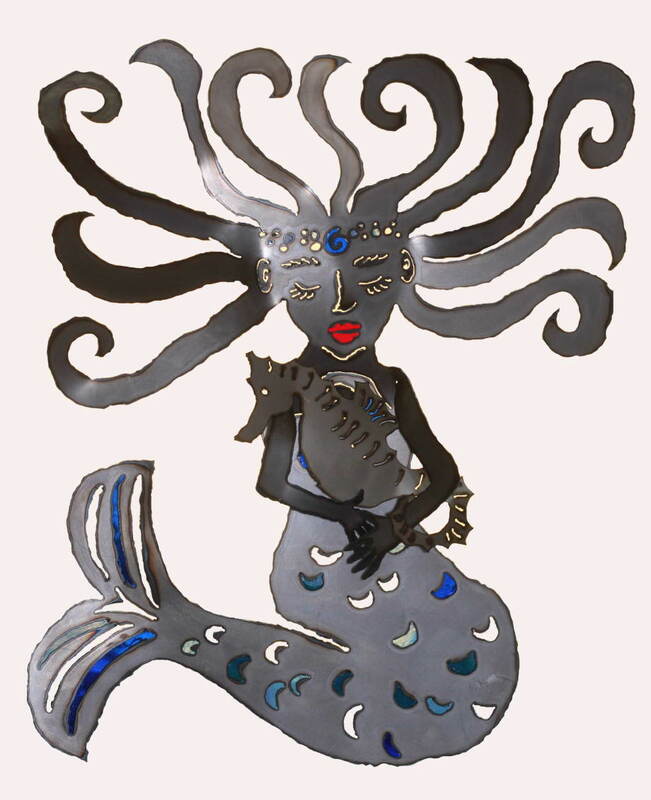 Since Madison's face and hair is stainless steel, as are some of the sea creatures, they will not rust if she is displayed outdoors. However, the steel portion - the vegetation and frame, will rust. 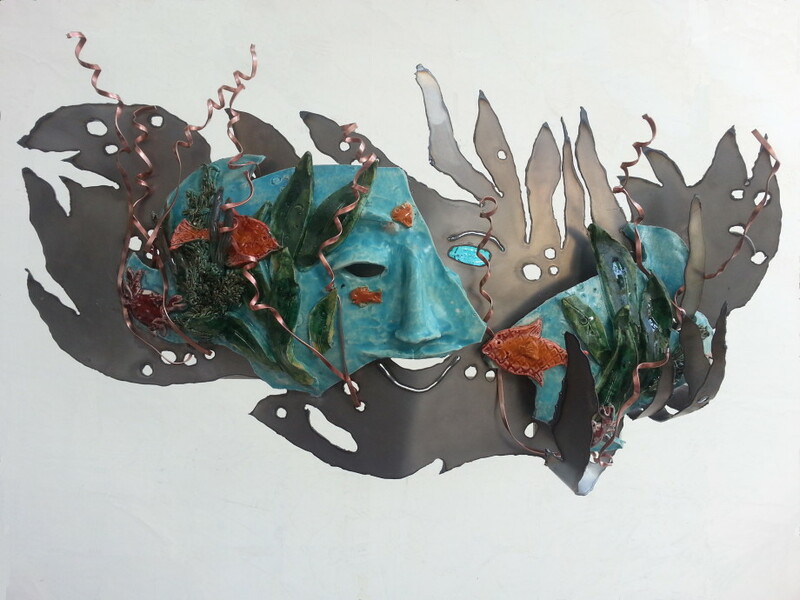 I enjoy creating pieces with different types of metal for these rust vs. shiny metal contrasts. 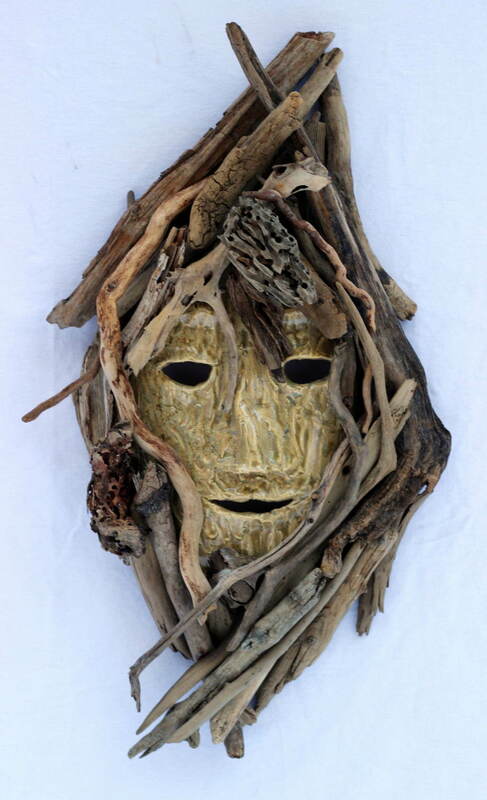 Mask created with aluminum pan and Lake Superior driftwood. Measures 18 x 24 inches. 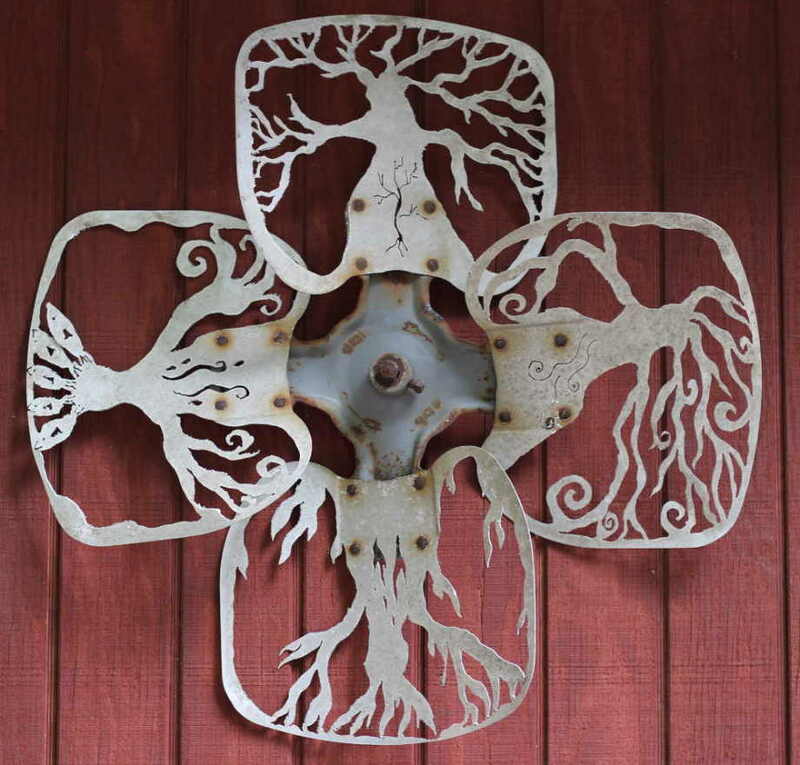 Steel and stained glass, 4 individual pieces. 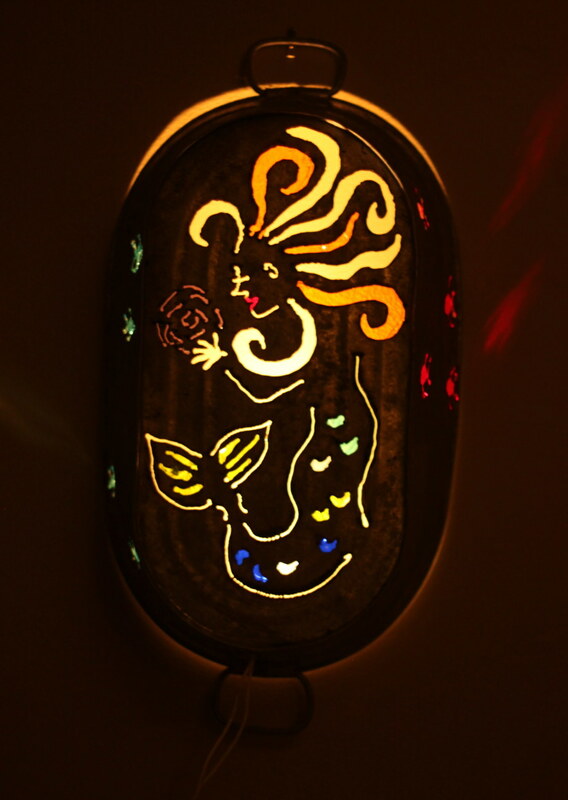 Stained glass is cut and adhered to backside of steel using a silicone-based adhesive rated for outdoors. Approx. measurements of each: 12 x 32 inches. 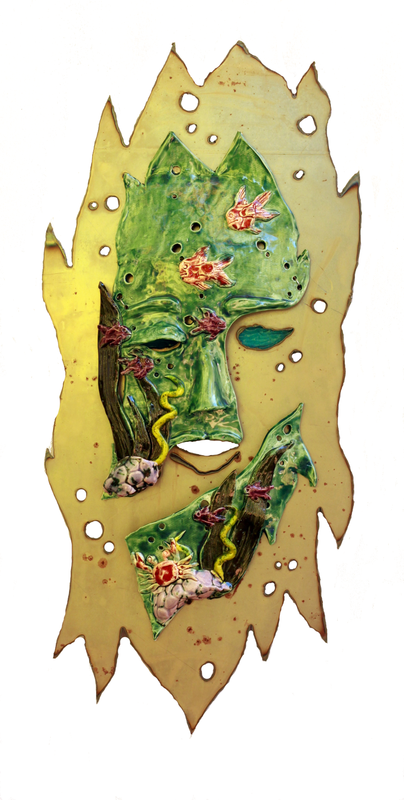 Inspired by Njord, the norse god of the sea. 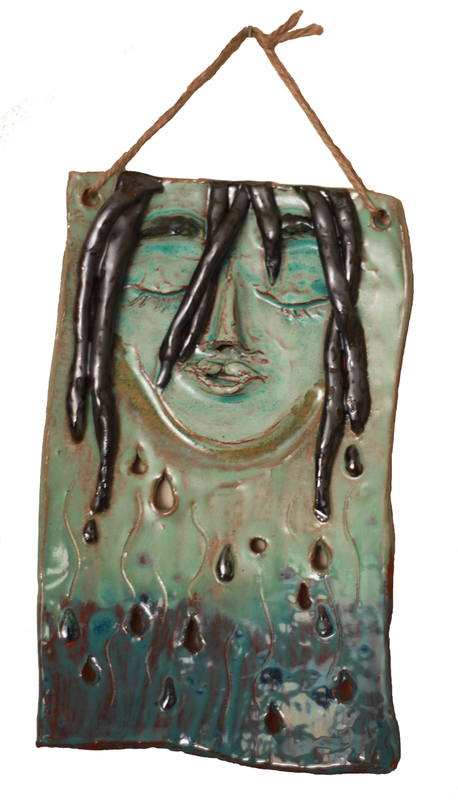 Steel, low-fire white clay, and stained glass (in eyes). Measures approx. 12 x 22 inches. 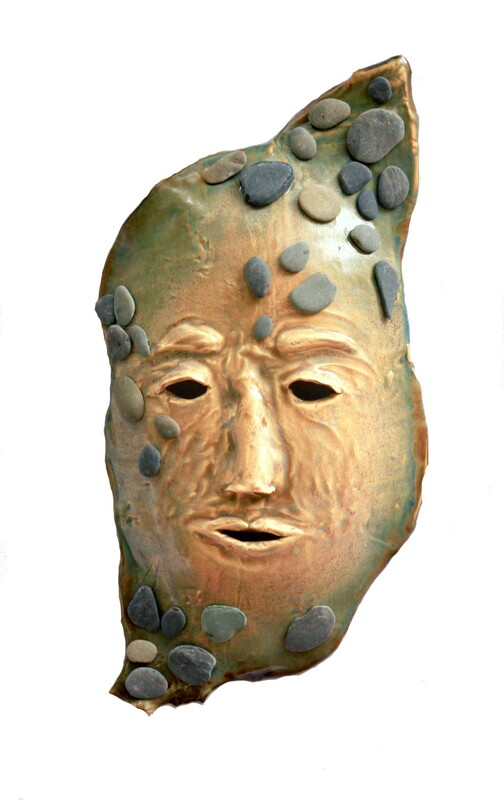 Hand-built with low-fire white clay and beach stones. Measures approx. 11 x 18 inches.